Kinetic and thermodynamic considerations reported by researchers at the Tokyo Institute of Technology suggest that thioesters at the heart of many theories on the origin of life are unlikely primordial contributors. The research is reported in Scientific Reports, 21 July 2016. How life emerged from a primordial soup of simple chemicals remains unknown. 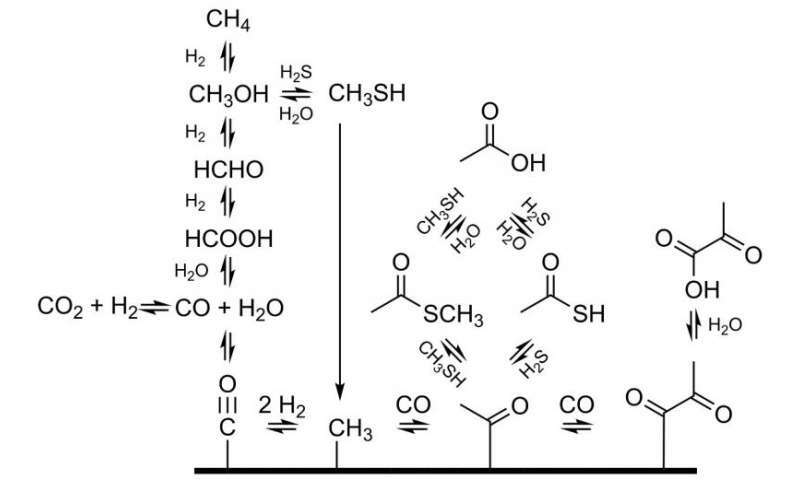 However, scientists have proposed several possible schemes for the origin of life, many of which rely on chemistry involving thioesters such as thioacetic acid (TAA) and methylathioacetate (MTA). Now, results of kinetic and thermodynamic considerations reported by Kuhan Chandru and his colleagues at the Tokyo Institute of Technology (Earth-Life Science Institute: ELSI), question the likelihood of these schemes. Many of the reactions that form biological matter require enzymes that would not have existed in prebiotic times. However, the high temperatures in hydrothermal vents can overcome reaction barriers without the need for enzymes, making them likely sites for the origin of life. With this in mind, Chandru, along with colleagues led by Jim Cleaves, studied the reaction kinetics in the conditions found in hydrothermal vents. The researchers used nuclear magnetic resonance (NMR) to study the reversible hydrolysis of TAA and MTA in a range of possible pH, temperature and concentration conditions common to hydrothermal settings. They conclude that "TAA and MTA differ significantly in terms of their stability and reactivity as a function of pH and temperature, though both are implausible prebiotic reagents for different reasons in different contexts." The researchers also add that the results suggest "estimates of the ubiquity of suitable environments for the origin of life in and beyond our solar system may be somewhat overestimated, if these compounds are indeed crucial for jumpstarting early metabolism." Chemical reactions can involve the release (exothermal) or absorption (endothermal) of energy. Many of the reactions that produce organic matter in organisms are highly endothermal. They are achieved in living organisms despite the presence of a large energy barrier to product formation thanks to enzymes, which provide a pathway with a lower energy barrier. In prebiotic Earth such enzymes would not be available so very high temperatures, like those found in hydrothermal vents, may have been needed. TAA and MTA hydrolyze to form acids and thiols. While this reaction is reversible, the equilibrium concentrations of TAA and MTA in the conditions that exist in hydrothermal vents are extremely low for schemes that base the origin of life on these chemicals. The exact conditions during the emergence of life on primordial Earth are unknown. However, what is known of the ancient oceans during the Archaen period (~4-2.5 x 109 years ago, when life is thought to have begun) constrain concentrations of hydrogen ions (that is, pH) as well as iron, carbon and sulphur to levels similar to those found in hydrothermal vents. These concentrations are all problematic for the generation of TAA and MTA. The product of the hydrolysis reactions is acetic acid. Isotopic measurements to date all point to biological origins of the acetic acid that exists in hydrothermal vents, which leaves questions over its existence in the primordial conditions present during the emergence of life.